Calvin Anderson Wins the $10,000 Razz Championship ($309,220)! It's about time that people stop thinking of Calvin Anderson as just an online-poker specialist. 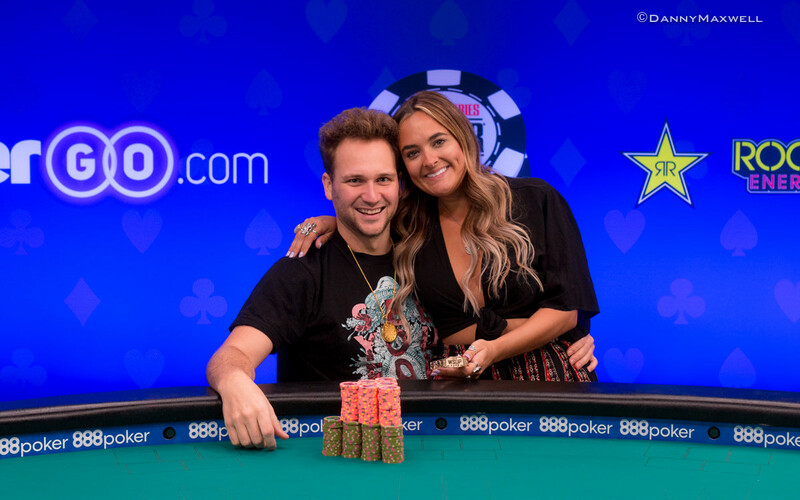 The 30-year-old Oklahoma native, in addition to his dozens and dozens of accomplishments on the virtual felt, is now a two-time World Series of Poker bracelet winner, besting a field of 119 players in Event #56: $10,000 Razz Championship. His previous bracelet came in Stud Hi-Lo in 2014, and a second mixed-game bracelet just goes to show what a well-rounded player Anderson is. However, for Anderson, it's about maintaining a positive attitude in poker and in life that has helped him to become so successful. "I spend a lot of time studying the Law of Attraction and a lot of other universal and spiritual truths from various people," a reflective Anderson said after his win. "And basically, I think it's important to keep a positive attitude because then you attract a lot of positive things in your life. I find that a lot of people, just in general, they're very victimizing to themselves. They're complaining about everything and it doesn't match the frequency of winning. A lot of people are complaining about being the victim, but I think maintaining the power is important. Whenever you do complain and get frustrated, you're losing a lot of power and giving it to someone else. Not only in the game, but anywhere else. Things like this happen all the time, and a big reason why I like poker is because it's so relatable to life in so many areas." Anderson has his share of critics, especially in a game like Razz where it's perceived simplicity is grossly misunderstood, but those who know better understand that there is more to it than just playing a few low cards and hoping to run the best. "It's an enjoyable game in general. Most of the game is hand based. You can't just bluff all in with deuce three off like hold'em. It's just a chill game in general. I'm very comfortable in all the spots, and I always know where I am. My game...I'm adapting constantly to how everyone's playing, putting myself in their shoes. So I may do one thing vs. another player that I would never do vs. somebody else. From their perspective, they don't really get that or understand that. Being close-minded is kind of why people are, I'm not really sure the word to say, delusional a bit about reality, I guess." The 2017 edition of the $10,000 Razz Championship drew 97 players and defending champion James Obst made the money once again in 2018, finishing in 16th for $15,256. This time a field of 119 players, a record-setting number for the $10,000 Razz Championship, creating prize pool of $1,118,600 with the top 18 spots being paid. The money bubble burst late on Day 2 with Chris Ferguson ending up as the last competior without anything to show for it. Only 13 players returned to the tables for Day 3 and the two shortest stacks, Ted Forrest and Eric Rodawig, were quickly sent to the rail. Paul Volpe's stack took a massive hit early on and he then lost back-to-back hands against Julien Martini to end up drawing dead on sixth street, ending his run in 11th place. Ismael Bojang tripled his stack early on, but lost two big pots in a row before ending up drawing dead on sixth against Frank Kassela's made eight-six to bust in tenth place. 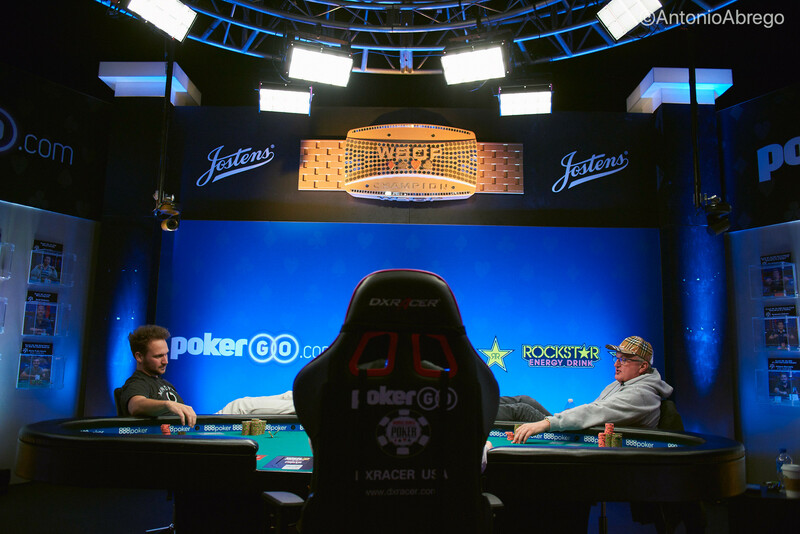 That set up the unofficial final table and Anderson was still in a commanding lead, while Allen Kessler was at the bottom of the counts. 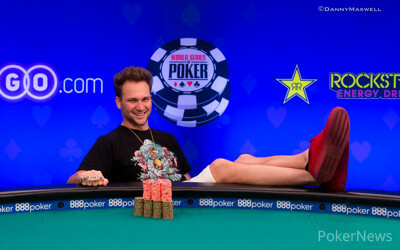 Kessler got short and ended up all in with an eight-six, Dzmitry Urbanovich made an eight-five on seventh street and Kessler peeled his last card, pairing his queen to exit in ninth place. Urbanovich, however, was the next casualty and busted in eighth place just days after finishing runner-up in Event #50: $1,500 Razz. The last seven players got moved over to the Brasilia Twitch live stream table and John "World" Hennigan played only one hand before bowing out in seventh place. Down to one big bet he was all in against the other short stack, Jerry Wong, and was drawing dead on fifth street against an eight-seven. Wong ran up his stack from there before becoming the short stack once again. Alex Balandin departed in sixth place, falling by way of Kassela's six-five on sixth street. 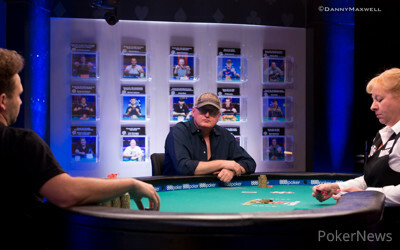 Kassela's chips were barely stacked up by the time he eliminated Wong in fifth place. On sixth street, Kassela was in the lead with a seven-six while Wong was drawing live, but he paired up with his final card. The following hand, Mike Leah ended up with an eight-seven on seventh street against Martini, who ended Leah's run with a six-five. 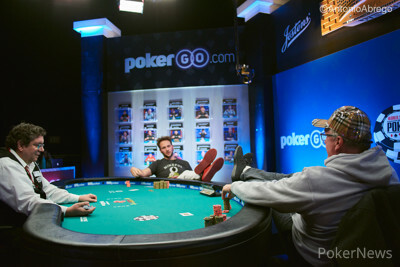 Down to the final three, Martini remained very active and that took a toll on his stack. While the Frenchman doubled up once, he dropped back to the shortest stack and his eight-seven on sixth street ended up second best to Kassela's eight-five on seventh street, setting the stage for an epic-heads up battle. What followed was a back-and-forth affair that even went through an entire extra level without being able to determine a champion. The lead changed dozens of times and Kassela avoided elimination once before play was halted for the night. Anderson was holding a more than 3-1 lead for the deciding fourth day. With the limits as big as they were, it took just five hands for Anderson to seal the deal. The fourth hand proved key as Anderson and Kassela went the distance, with Anderson's nine-seven edging Kassela's nine-eight to leave Kassela with just two antes. The match ended the following hand, and Anderson spoke about the lengthy heads-up match. "We just didn't run any big coolers. He was playing a very very passive style, so he wasn't bloating any pots which isn't a bad strategy in a lot of situations. It just made it where we didn't ever play any big pots. He never really three-bet me, or reraised when I would raise his completion. He would just trap all of his hands, so the pots never got big at any point really. We just never ran a big hand into another big hand. Not that many times, at least. So that's kind of why the heads-up lasted so long. I wish it would have finished yesterday because at the end of the night I feel like that's where I'm most zoned in and focused. I could have played another 10 or 20 hours, probably. It's just how I'm built. It's quite different than most I would say, but I focus more when it's late." Anderson is now a two-time WSOP bracelet winner, but winning in poker doesn't equate to winning in life, and Anderson's been a champion there long before this tournament ever took place. Frank Kassela was all in on third street for his remaining 30,000 after the ante. "Well, we could have finished this last night," chuckled Kassela after the hand. Frank Kassela had the bring in for the first two hands and folded to a completion, then folded on fourth. In the third hand, Anderson completed and folded to a raise. The fourth hand, however, would provide fireworks and leave Kassela with a mountain to climb. Kassela completed with a queen and Anderson called with a king as the bring-in. 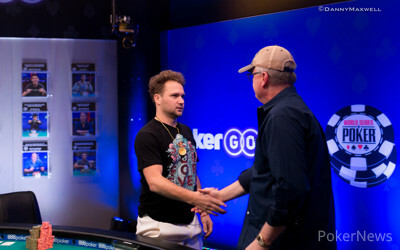 Kassela bet all the way through to seventh and Anderson called him down to get shown the for a nine-eight by Kassela. Anderson showed for a superior nine-seven and Kassela was left with exactly two antes. After 11 full levels on Day 3, the 2018 World Series of Poker Event #56: $10,000 Razz Championship saw the final 13 hopefuls out of a 119-entry strong field whittled down to just two, and the heads-up between Calvin Anderson and Frank Kassela lasted for more than four full levels before they bagged up for the night. Anderson will return to the PokerCentral Twitch live stream table in the Brasilia room with a comforting lead, holding 4,585,000 compared to Kassela's 1,370,000. The action will recommence with limits of 150,000/300,000 and an ante of 30,000, giving Kassela 4.5 big bets to start with. Will he be able to turn things around and claim his fourth WSOP bracelet or will Anderson add a second to his poker resume? Both contenders have already locked up $191,111, however, all eyes are set on the coveted gold bracelet and the payday of $309,220 that comes along with it. Make sure to tune back in and find out who will end up victoriously in the overtime of this epic heads-up battle, as the PokerNews team will be right there to deliver all the action as of 2 p.m. local time.